Cheers! What if you could go green without the significant upfront costs of solar or wind? The goal to reduce greenhouse gas emissions has created an interest in all solutions that are sustainable. Power factor correction (PFC) is a simple and inexpensive technology but it’s often overlooked as a green solution. But before we get into magnetic fields and the science behind power factor correction, how about we compare PFC to something simple: beer. Let’s pull up to your favorite brew. Consider the cold one, both the mug and what it contains. Picture the elements: the mug, the beer and the foam. Imagine that the three elements together present a picture of power. The mug capacity represents apparent power (kVA). The beer itself represents active power (kW). The foam represents reactive power (kVAR). Power factor is the ratio between the active power (kW) and the apparent power (kVA). Using the beer analogy, we obtain the power factor by dividing the beer by the mug capacity, and it’s clear, you’re getting less beer than you’re paying for with all that foam taking up space. Who wants to pay for foam? As we sip on that virtual beer, consider some pertinent facts. The nearly five million buildings in the U.S. produce nearly 20% of the country’s energy use and greenhouse gas emissions, according to the EPA. The buildings also are inefficient. 30% of the energy consumed in commercial buildings is wasted. Many facility executives are looking to solar or wind, and other renewable energy sources to find a solution. But drawbacks exist. Drawbacks include the considerable upfront expenses to implement these solutions. Renewable sources like solar and wind can also be unreliable, since they require ideal weather conditions to generate energy. Power factor correction, however, is a great way to improve efficiency without the costs or unreliability of renewable energy sources. All inductive devices such as motors that operate on AC systems convert electrical energy into work and heat. This is active or real power. Magnetic fields are necessary to perform this conversion. These fields are associated with another form of energy known as reactive or “wattless” energy. 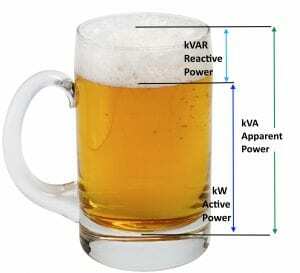 Your energy provider charges you for both types of power: active power (kW), (the beer), that is used to perform the actual mechanical work and reactive power, (kVAR), (the foam), that needs to be supplied, which is not useful power. To adequately power a load, the utility must supply enough energy to cover both the real and reactive currents. Since Power Factor = Active Power [kW] / Reactive Power [kVA], lower power factor equals lower efficiency. (In general, power factor can vary between 0 and 1.) When PF<1, there are AC currents circulating in the line that do not transfer working power, but cause heat dissipation in the wiring, create an extra load to the generators and require larger electricity generating equipment. There could be dozens of machines with a poor power factor within a facility. The machines draw excess energy daily. This costs money and adds to carbon emissions. In addition to higher internal costs is the liability of utility penalties. Penalties and surcharges can add thousands of dollars a year to the cost of running your facility. Your utility bill may not show a power factor penalty, but that doesn’t mean you aren’t still paying extra. Your bill may include hidden, additional charges for poor power factor. Download this handout and learn how to find penalties on your bill. These charges can often be reduced or even eliminated by using power factor correction capacitors. In addition, PFC can deliver energy reductions of 30% or more. It effectively enables companies to get more power out of the same amount of utility electricity, therefore operating at optimum power. Remember that mug of beer, with too much foam at the top? To bring the power factor as close to 1 as possible, capacitors are commonly added to the system near the loads. They help compensate for reactive power and maintain power factor at an ideal level for efficiency. Adding a low-voltage capacitor bank such as VarSetTM from Schneider Electric provides better energy efficiency and lower electrical costs, up to 30% the first day. VarSetTM capacitor banks can raise your power factor to a level that avoids penalties. AccuSine+TM Active Filters also deliver power correction in addition to harmonic filtering, maximizing system utilization and planning while reducing the harmful effects of harmonics in your electrical system. Power quality solutions can help reduce utility bills by correcting power factor, increasing efficiency in the network, preventing resonance, and reducing downtime. So upgrade your facility today to save on energy costs, increase efficiency, and meet new sustainability criteria. Cheers! very nice article that you shared is very impressive.. thanks for sharing..